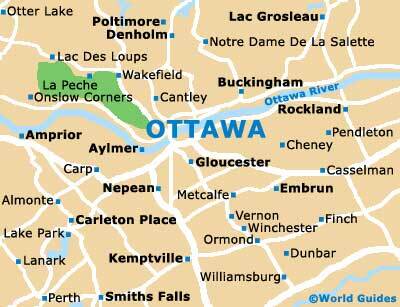 Ottawa is located in the province of Ontario (ON), at the point where the Rideau and Gatineau rivers meet the Ottawa River, with views of the scenic Gatineau Hills of Quebec to the north. The capital city of Canada, Ottawa has long been a major tourist destination and is a vibrant, lively spot, visited by more than five million tourists each year. In recent years, much of Ottawa has been radically renovated and restructured, to ensure that the city has the grace and style of a province capital. 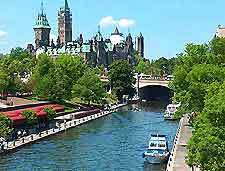 Offering a range of cultural activities, museums and art galleries, Ottawa is famous for its calendar of festivals, which include ice skating along the frozen Rideau Canal each February, a tulip festival in May, and several jazz events in July. Surrounded by an extensive greenbelt area, Ottawa is divided into a number of regions and districts, including the downtown district, where many of the best shops and restaurants are located, together with major buildings and landmarks. Further notable districts in Ottawa include the Glebe area, Byward Market, Sandy Hill, the residential western districts, and Chinatown, which is often known as the Somerset Heights. It is hardly surprising that Ottawa, Canada's capital city, has so much accommodation on offer. Hotels is Ottawa vary greatly and suit most requirements, with some of the most popular standing in the heart of downtown Ottawa, along both Albert Street and Rideau Street. Further hotels can be found around Byward Market, Parliament Hill, the Rideau Canal, and in towns and villages close to Ottawa, such as Cornwall, Nepean, Perth, Smiths Falls and Hull - which is officially known as Gatineau. More information about Ottawa Hotels. 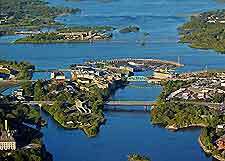 Tourism in the Ottawa is well supported and the city has much to offer tourists and visitors, with impressive facilities and amenities. The main tourist information center in Ottawa is Capital Infocenter, which is located along Wellington Street and offers a range of travel tips, information about hotels, brochures about tourist attractions, and modern interactive computer terminals with touch screens. Ottawa's main tourist attractions include river cruises - a particularly scenic way to travel around the city, with regular tours along both the Rideau Canal and the Ottawa River, taking in many of the main sights and landmarks; the Royal Canadian Mint - a historic building responsible for the producing many thousands of commemorative coins each year; Dows Lake Pavilion - close to Ottawa city center, with many seasonal recreational activities, including a range of summer water sports and winter cross-country skiing; and the Gray Line Ottawa - guided Trolley Buses, which travel around the city and provide a real insight into Ottawa's rich heritage. Popular parks and gardens in Ottawa include Confederation Park, Gatineau Park, Major's Hill Park and Nepean Point, which is known for its superb views across Ottawa and beyond. Further tourist attractions in Ottawa include the National Archives of Canada - an impressive research center home to many millions of important historic documents, maps and photographs; the National Library of Canada - housing more than 10 million books and publications, together with local archives and general historical Ottawa information; Ottawa Civic Center - hosting many notable events throughout the year, including regular ice hockey championships; Gatineau Park - a large and natural parkland close to central Ottawa, with lakes, nature trails and woodland areas; Major's Hill Park - the city's oldest public park, dating back to the 1870s, offering superb view of Ottawa city; and Nepean Point - a well-known lookout area with views across Ottawa city, together with a statue of Samuel de Champlain, the actual founder of the country. Notable landmarks and monuments in the Ottawa area include Parliament Hill - Canada's true center of politics, comprising many magnificent buildings, including the eye-catching Peace Tower; Laurier House - home to a former Canadian Prime Minister in the latter part of the 19th century; Notre Dame Basilica - a truly breathtaking cathedral, with Neo-Gothic architecture, twin spires and stained-glass windows; Prime Minister Residence / 24 Sussex Drive - probably Ottawa's most famous address, located in Ottawa's Lowertown area; and the Supreme Court of Canada - a major legal center in Canada, with courtrooms, guided tours and a striking façade. 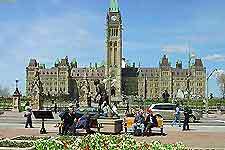 More information about Ottawa Tourist Attractions and Ottawa Landmarks and Monuments. Ottawa's main museums and art galleries include Bytown Museum - celebrating the history of the 19th-century Rideau Canal, with many exhibits and information about its construction; Ottawa's National Aviation Museum - part of the Rockcliffe Airport complex, with many restored vintage aircraft and an exciting hang-gliding simulation; the Canadian Museum of Contemporary Photography - opened in the early 1990s, with many regular exhibitions throughout the year; the Canada Science and Technology Museum - with interactive fun for families in Ottawa, including space travel exhibits, hands-on gadgets, educational information and regular demonstrations; the Canadian War Museum and Vimy House - containing a wealth of military memorabilia and artifacts; the National Gallery of Canada - a stylish and eye-catching building, housing one of Ottawa's most popular art galleries; and the Ottawa Art Gallery - standing in the city center, with a vast collection of local art works and seasonal exhibitions. More information about Ottawa Museums and Ottawa Art Galleries. Tourist attractions located nearby Ottawa include the Canadian Museum of Civilization - Canada's biggest cultural institution located just a few minutes from Ottawa in nearby Hull, containing many varied collections, thousands of exhibits and the Canadian Children's Museum; the Mackenzie King Estate - situated in Gatineau Park, covering in excess of 200 acres / 80 hectares, including the famous Moorside Cottage; and Brébeuf Park - standing in Hull along the banks of the Ottawa River, known for its recreational activities and historical importance. More information about Ottawa Attractions Nearby.